Owned by Ken Stowell of Salisbury in 1965, believed to have gone to Cape Town, South Africa. 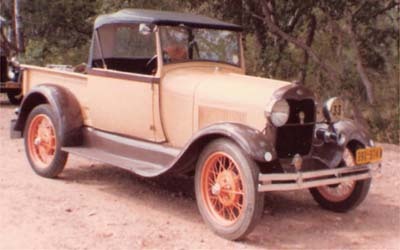 Very early Model A with single braking system. Owned by T.W. Rackham of Bulawayo in 1968. Later went to Johannesburg. Built up from scrap by Bill Charnock in the mid 1970s, now in South Africa. Owned by Brian Louth of Bulawayo. Rebuilt from parts acquired from various scrapyards as well as from Arthur Claasen. Rebuild finished around 1998. Built up from parts by Jimmy Williamson in the mid 1970s. Taken with him to South Africa in the 1980s. References 7th Annual VVC Zimbabwe Rally. Owned by Dr. P.J.D. 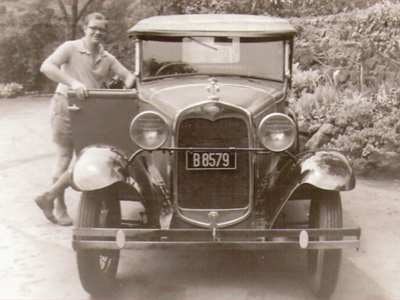 Van Wyk in 1968, later acquired by a Dr. Ryan, then Alan Reid who possibly took the car to South Africa. Year 1928 Owned by Alec Philp since around 1968. Passed onto his son Liam after Alec passed away. References 7th Annual VCC Zimbabwe Rally; 1972 Annual Vintage Reliability Run. Year 1928 Built up by Bob Southon around 1982. Believed sold to an American film director who took the car back to America. Built up from parts by Mike Le Patourel in Rusape. By 1970 the car had been used on 2 Shell Umtali and 2 Beira runs. Owned by Mike till he passed away in 2009, car owned by his wife Jenny who too the car to Australia. American built car. 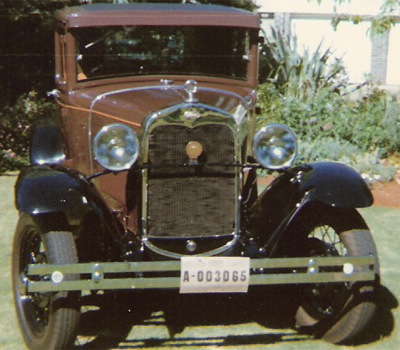 Owned by Arthur Claasen of Bulawayo in 1970. Found as a pile of scrap in 1952 and completely restored. Fitted with a model B engine. Owned by A. Nicholson in 1965. Later owned by M. Stephenson, Tony' A.E. Roe of Salisbury in 1970 & 72, then Sue Davidge-Pitts. A much rallied car, believed to now be in South Africa. Body found on a farm in Marondellas, rolling chassis in Hatfield. Rebuilt and used daily by Dave G. Parsons of Salisbury from around 1965. Completed 5 reliability runs to Umtali and two Beira runs. Believed to still be in Zimbabwe. 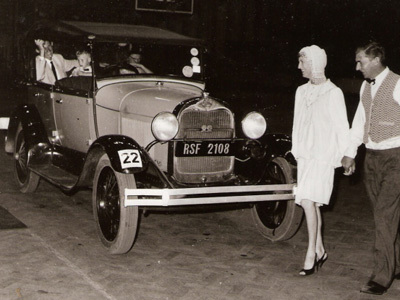 Year 1928 Body No F2591. Owned by Bill Wood 1972-1975, ex George Allman (1965). Photo taken at Bill Wood's residence, Salisbury. Later noted with T. Jefferies of Cape Town. Owned by Dr. B. Perchman in 1965. Car was involved in an accident in Beira on one of the Beira runs - Repaired and driven back home. Rebuilt by John Apps of Que Que around 1989, still owned by him in Bulawayo. 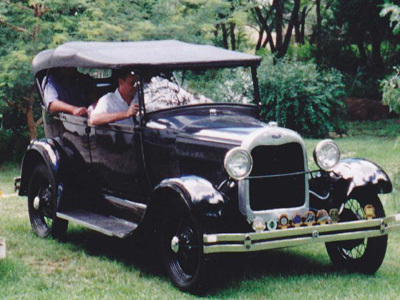 Acquired by Doug Berry's father from the original owner, used as a family car till 1945. Then cut in half and used as a chicken run. 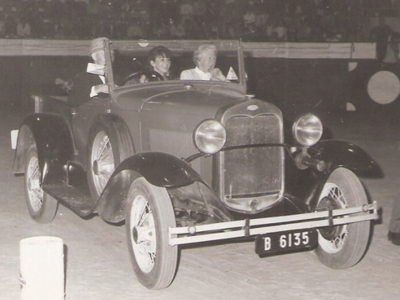 Doug Berry restored the car in 1963 and used it regularly, often towing a caravan to South Africa for holidays. Acquired by John Apps after Doug passed away. Body no. 0007773Owned by Colin R. Morris of Salisbury in 1965-1970, who was the car's third owner. 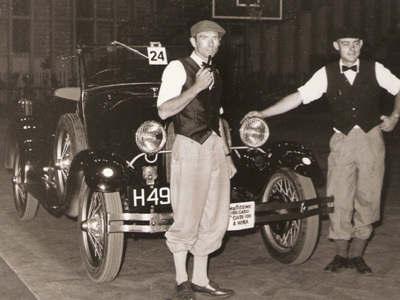 The car was running regularly until 1952. Found virtually complete and restored in 1963. 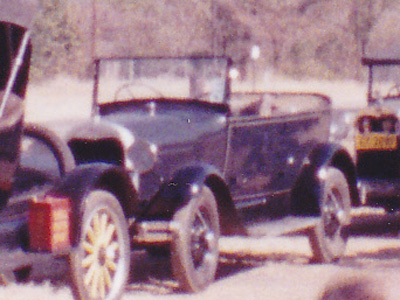 The original owner believed that only two coupes were sold in Salisbury in 1928. Competed seven Umtali runs, won the "Charles Griffiths" trophy three times and competed in numerous local events. Rebuilt from parts by Eddie Flawn in the 1970s, completed around 1979. Later sold to Howard Butler then Gordon Read then Dawie Erasmus who still has the car in Harare. Owned by Francis Scott of Umtali in 1966. Built out of several scrap heaps. Most parts came from H. Truter of Odzi. Engine is from a 1930 sedan, chassis from a 1928 car. 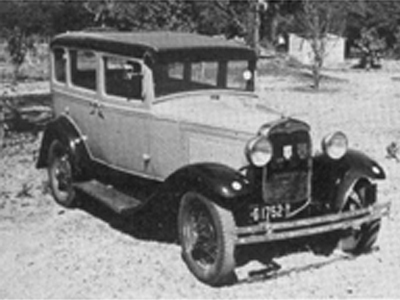 The sedan windscreen was mounted onto the 28 tourer body, steering was found in the Maranke Reserve. Rebuilt and owned by H. Lombard of Odzi in 1967. Believed to be in South Africa. Owned by F. Sargent in 1965. Owned by Rob Marshall of Harare since the 1970s. Engine removed and fitted to Rob's roadster. Car for sale in 2010. Belonged to W.C. Jamieson of Bromley in 1936, the earliest date in the registration book. 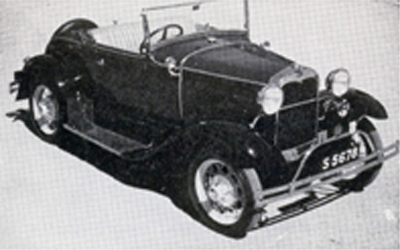 Licensed till 1951, the car then stood on blocks till 1968 when it was acquires by E.F. Tessendorf of Gatooma. Owned by Trevor Wiggington in 1973. Found in derelict condition in Glendale by Matt Stevenson, sold to Stan Dent (around 1970?). Body found by Bill Clarke and Wiggy Bennett at Den Sheperds Farm in Norton. Rebuilt by Lat Fuller for his brother Roy around 1987. Later sold to Howard Butler, then to someone in Botswana. Acquired by George Posselt from the original owners, rebuild completed in 1984. Later sold to Steve Garrett, possibly now in Australia. 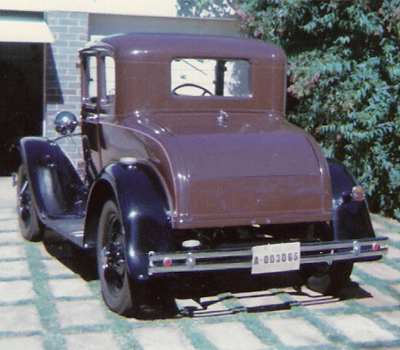 Owned by Edward Fay of Bulawayo in 1967. 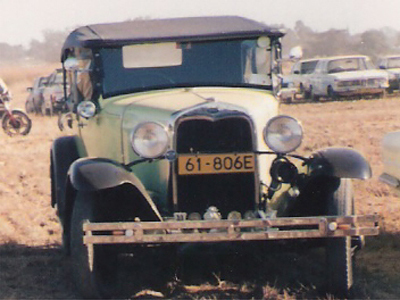 Found as a running farm truck in Chipinga, most of the body was missing, rebuilt by James Hardaker of Umtali in 1975. Canadian built Ford. Acquired by Eddie Flawn in 1957 from Puzey & Diss salesman Nicky Belford. Used by Eddie in the 1st Annual Vintage Reliability Run in 1959 and in many others, including the the 50th Anniversary run in 2009. Still owned by Eddie. Registration Numbers B-3598/SRH, 290-900-V/RHO, AAT-5230/ZIM. References Eddie Flawn; VCCZ Newsletter July 1990, Nick Wood, 1961 Annual Vintage Reliability Run. 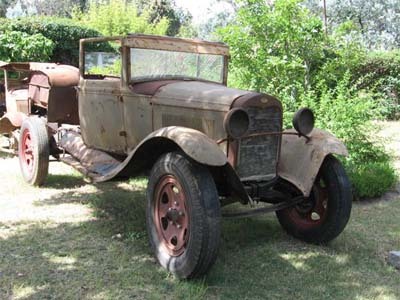 Year 1929 Axles, engine, gearbox bought as scrap in Nyanga. 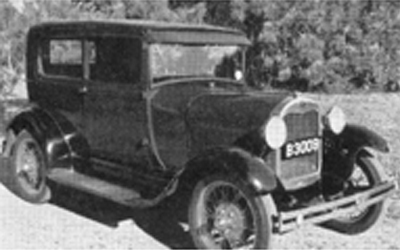 Body and chassis bought from R. Skipwith in Penhalonga. Rebuilt by Brian William Barrett around 1980. 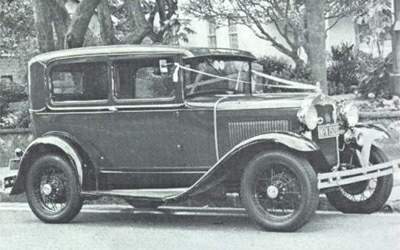 Year 1929 Originally a tourer which was cut behind the front seat and fitted with a pick-up box. Owned by Tommy Lemon from 1977 until he passed away. Sold by his widow around 2006, possibly to someone in South Africa. 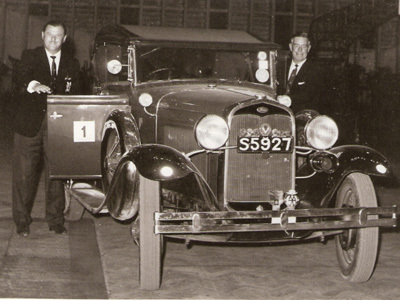 Year 1929 Owned jointly by Messrs. M. Wakefield, C. Stobart and M. Tippet in 1973. 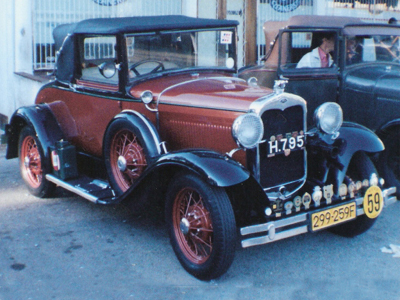 Year 1929 RHD. Manufactured in Canada and shipped to either South Africa or Southern Rhodesia. Discovered in Bulawayo by the Matthews family around 1970. Partially restored and used on various car runs. Sold in 1994 to Nigel Tucker, another partial restoration carried out, folding top fitted, major engine work carried out. Used extensively for rallies and outings in Zimbabwe and South Africa. Shipped to the UK in 1998.
with a home made pick-up body. Restored with tudor sedan body. Canadian built car. Purchased from Ian Bull around 1964 by Alex Atkinson of Salisbury. 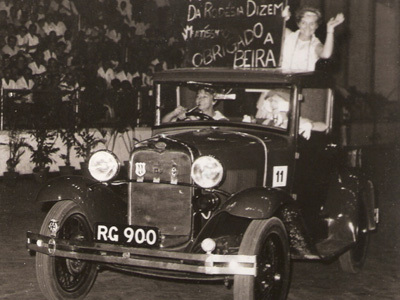 Winner of the 'Donas Elviras' rally in Beira in 1965, runner up in 1966. 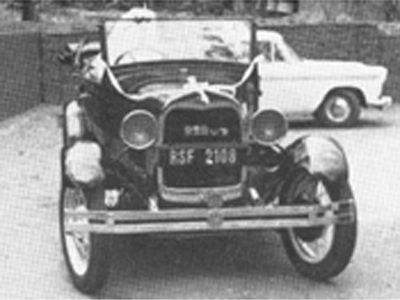 Competed in all Shell Runs till 1980, car known as 'My Fair Lady'. Also on 1961 AVRR - See 1972 AVRR. Later taken to Cape Town, South Africa, where the car was sold in 1988/89. Colour photo taken on a Fort Victoria Run. Year 1930 Auctioned by Burchmores auction 3/12/1987 in South Africa. 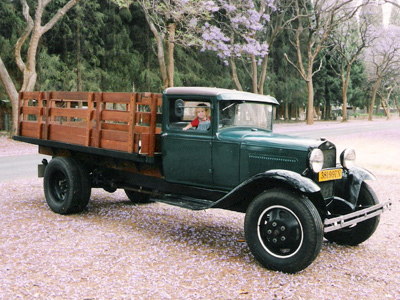 Year 1930 Owned and restored by Jan Van Tonder of Enkeldoorn in 1973, later taken to South Africa (around 1980). Year 1930 Owned by Roger V.G. Link around 1963. Acquired by J.M. Johnson around 1965. Photo taken on a Shell Umtali Run c1963. 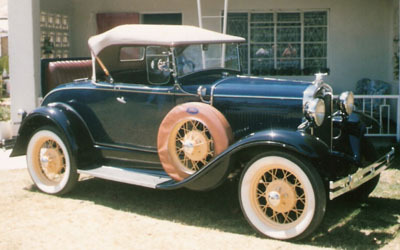 Year 1930 Owned by Mike Geldard in 1967, later sold to Dr. John Davy who still owns the car in Harare. 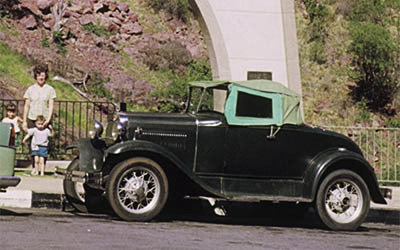 Fitted with a 1931 radiator shell after the original was damaged in an accident. Year 1930 Owned by Garth MacLoed-Selkirk in 1967. Later owned by Chris Regeris, then Keith Murrell. Keith restored the car, repainting it yellow / black. Owned jointly today by Keith's sons Alan & Kevin in Harare. At one stage owned by someone at Alaska Mine. Owned by Alec Henderson and used in the 1st Vintage Car Reliabilty Run in 1959. 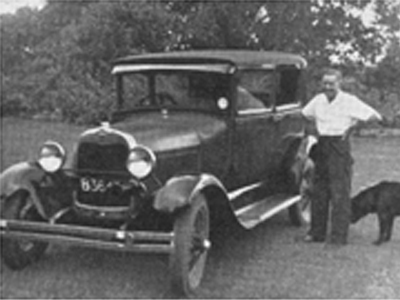 Later owned by someone in Umvukwes (possibly J. Chesney-Martin who owned the car in 1961) from whom the car was acquired by Hilton Goodall and later A. Napier. Both photos were taken at Donnybrook Circuit but some 30 odd years apart. Still in Zimbabwe owned by Howard Butler. Year 1930 Rebuilt from scrap by Neil Snatt, rebuild completed around 1980. Later taken to Durban, South Africa. 157" WB with double rear wheels, wooden stakebed. Body no. 12F974. May be an English AAF and not American or Canadian as some parts are marked AAF. Found on a farm in Penhalonga. Possibly the only lwb in Rhodesia, owned by Alan W.B. Napier. Later sold to Jon Atkinson who fitted the wooden stakes on the flatbed, sold to Richard Paxton, may now be in South Africa or Australia. 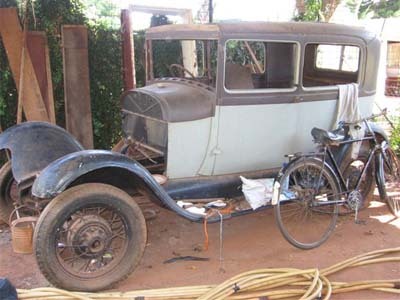 Owned by Mike Smith of Harare in the 1970s and 80s. Later sold to Dave Riley, then in 2006 to Viv Westbury and in 2007 to Martin Sherfield of Bulawayo. Owned by Albert Victor Lowe of Bulawyo in 1965. Later acquired by L. Fay. 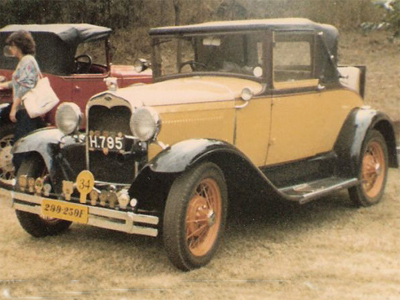 Bought from Mr. Maritz of Chakari in May 1971, body had been cat at the back and converted into a coupe imperial. Restored by Keith Rommans between 1971 nad 1975, later sold to Rob Marshall who used the car extensively on rallies. Engine CAT9863 was replaced after it was worn out. Undergone cosmetic restoration in 2010 and taken to Melbourne Australia by Rob. 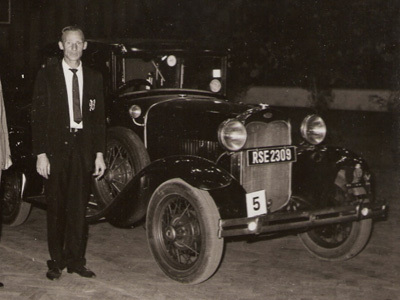 3rd owner was a Mr. Robinson of Bindura who sold the car to John Rae (Ian) and Anne Findlay, (who changed colours to green /black then yellow / black), car rebuilt and used in many runs since the 1960s. 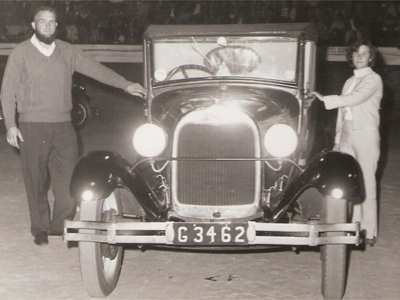 Later acquired by Dawie Erasmus (changed to current colours) who still owns the car. Built up from several parts cars by John Rae (Ian) Findlay around 1972. Year 1930 Owned by Roly Wright in 1980. 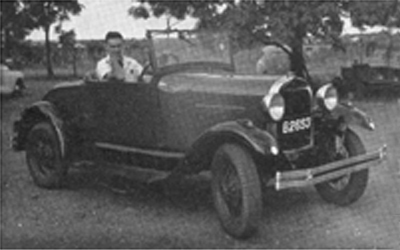 Year 1930 Car taken to Bulawayo from Salisbury by Mike Issacson. Later sold to Henry Bester, then Tony Wright who rebuilt the car around 1968. Owned by Tony till he passed away in 2005, passed onto his son. Possibly now owned by Dave Potter of Bulawayo. 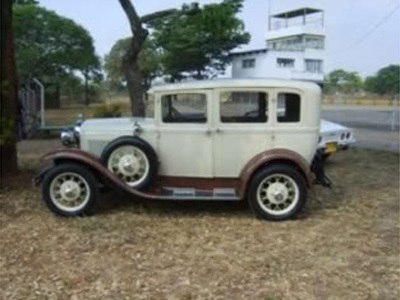 Year 1930 Bought new in Livingstone, Northern Rhodesia by a Mr. Wyngaard. Owned by Bryan Gillmaster in 1969. Believed to now be in the UK. Fitted with radiator shell with painted insert top & bottom, fuel tap on firewall recess, making the car at least a 1931 model! 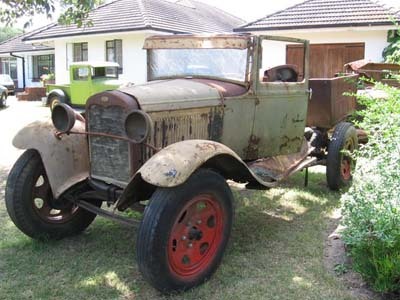 Year 1930 Acquired in 1973 by Stewart Reeve from a Mr. Muller in Rusape, who said the vehicle had been on the farm since 1940. Part restored when acquired, Mr. Reeve finished the rebuild. Later taken to South Africa. Year 1930 Owned by D.R. Forbes in 1966, still owned by his widow Rosanne. Year 1930 Double side mounted spares. Owned by Alex MacKay, then Don Lockhead, Menno Kok in 1964. Year 1930 Built up from parts by George Bennett. Later sold to Alan Napier then Paul Domeney in 2002, who stil owns the car. Year 1930 Found in Nyasaland (Malawi) in the late 1950s by George Bennett. Nicknamed Henrietta. Restored by George in green / black livery. Later acquired by John Apps of Bulawayo, car now in Cape Town, South Africa. 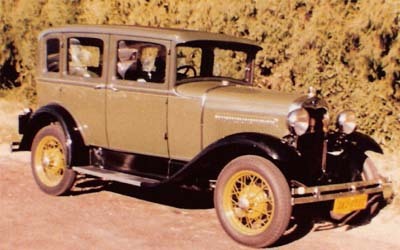 George also rebuilt a 1931 Victoria Sedan, given to his daughter, taken to the UK. Year 1930 Purchased by Donald Tibbenham in 1964, complete but derelict - Rebuilt by 1981. Rebuilt from parts by Jimmy Drummond in 1977. Owned by Jimmy till 2006 when it was sold to John Pike, Wally Hankey then Andrew Brown in Harare. 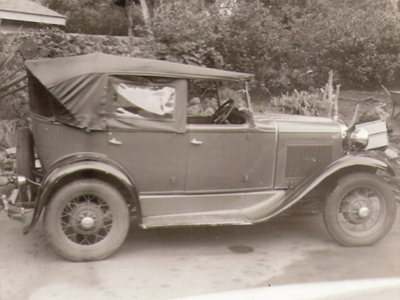 Bought new from Livingstone Motors, Northern Rhodesia by a Mr. Wood, who lived in Luanshya. 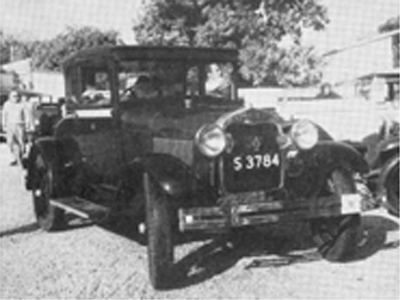 Car taken to Southern Rhodesia by his widow in 1959 and put up on blocks in Essexvale, near Bulawayo. 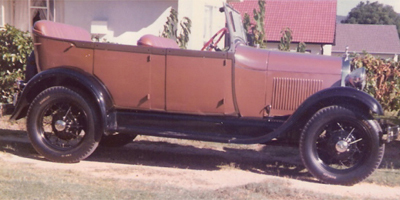 Car acquired in 1964 by C. Higgs, who handed the car to Dells Motors in Bulawayo who replaced the brake linings, kingpins and valves. Owned by R. Baden-Powell in 1974. Year 1930 Discovered in Que-Que, owned in 1972 by Alex Atkinson, then Chris Gael. Owned by Mike Frudd (painted red / black), following several other owners possibly including lan Napier, Howard Butler and Dawie Erasmus. Noted in Bulawayo in 2005, possibly now in South Africa. Original engine from this car fitted to the 1930 Ford A that Alex owned. 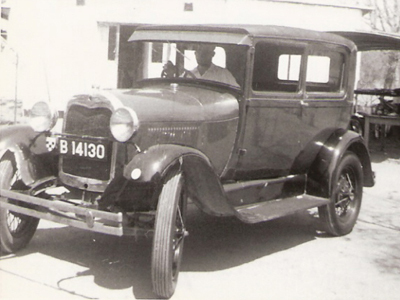 Originally registered in Northern Rhodesia, the vehicle having been supplied new to Livingstone Motors, Livingstone. Acquired around 1972 by Mr. H. Muller of Morester farm, Rusape. Chris Gael acquired the remains in August 1977 at which stage the car had no rear body, floorpans or seats. A roadster rear body section was found on the Donnington Estates near Norton, and the car was restored by Chris together with parts from other cars. Restoration completed around 1979. Car later sold and shipped to Australia. Body no. 9F1156. Built up from pieces by Alan Napier in the late 1970s. Year 1930 Owned by C.F. Van Rooyen in 1966, then by W. Clarke of Salisbury in 1970. 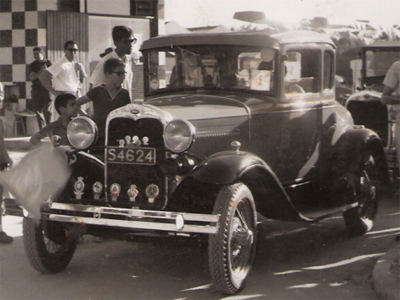 Restoration commenced in 1965 and the car was used regularly in local events. Owned by Hilton Goodall, then Gerry Morgan. Possibly owned by a Mr. Dickenson. Acquired by Alex Atkinson who later took the car to Cape Town, South Africa, where the car was sold around 1982/83. Known as 'Mary'. Engine in this car originally came from the Ford A pick-up that Alex owned. Year 1930 Owned by Sid Moorcroft, a farmer in Umvurwi, car was pretty derelict. Restored by Lat Fuller for Sid in the 1980s. Offered for sale on the www by Peter O. Marchussen of Harare in 2006. Appears to have been inmported into Rhodesia in 1947 by a farmer in the Umvukwes area. Believed to have been sold through Wally Hankey to South Africa. Year 1930 Bought by V.L. Jenkinson in 1956 from a scrapyard in Que Que, used as a bush vehicle. Then bought by Mr. Richie of Highlands, Salisbury. Acquired by Hilton Goodall around 1963, who restored the car. Photo taken on a Shell Umtali Run. Owned by R.S. 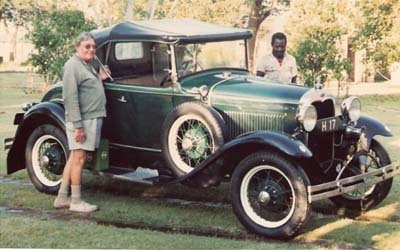 Zlattner of Bulwayo in 1969, later owned by Trevor Thomas then a Mr. Pesken of Bulawayo. 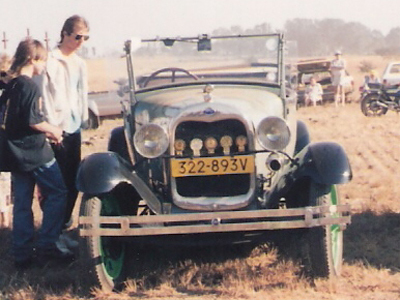 'The Flying Naartjie' owned by Fred Hickman, who had found the car in use as a chicken coop. Owned by George Fardell in 1965. Photo taken on a Shell Umtali Run. Possibly now in the UK. Rebuilt by John R. Jackson in 1969, still owned by John in 1990, Possibly the car used by David or Ian Jackson in 1980? Taken to the UK by John in 2005. Canadian built. Ex Fort Victoria, rebuilt by Edward Henry Rowan. Later sold to Matt H. Stevenson of Salisbury, certainly by 1970. Restoration recently completed in 1970, taken part in a few club events. Later passed onto Matt's wife and taken to Bulawayo. Year 1930 Owned by Christopher Bennett of Concession in 1990. Owned by Tony Wright in 1980. Found by George Smith, abandoned in the bush and restored by him in the early 1980s. Appeared in an article in the Herald on 19/02/1984. Later passed onto George's son Mike, who owned it into the 1990s. Sold to Dave Riley from whom it was acquired in 2006 by Viv Westbury. 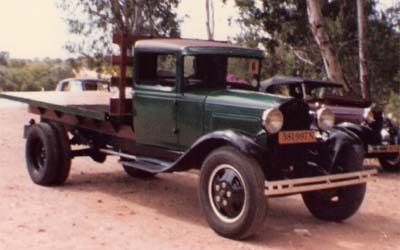 After acquiring the truck Viv realised the cab was from a 1932 model and therefore incorrect for the chassis. The cab was removed and sold to someone in Botswana. Viv has fitted a roadster body, no. 6F6255 which had been owned by Bob Southon who had started restoring it before selling it to Robin Hurst, from whom Viv acquired it. Acquired by P.A. Sullivan of Bulawayo in early 1965. Restored before the 1965 Rhodesian National Rally. Built in America. Year 1930 First registered in South Africa, used by a plumbing company. Later taken to Rhodesia where it was last licensed in 1950 by a Native in the Mount Darwin Native Reserve. Acquired by Charles MacDonald in 1960, after being rebuilt the car ran in the 1962 Shell Run. Believed to have been lent on permanent loan to the Salisbury Bottling Company, on condition it was not sold without the original owner's permission. Today the car stands derelict in the Coca Cola yard in Harare. 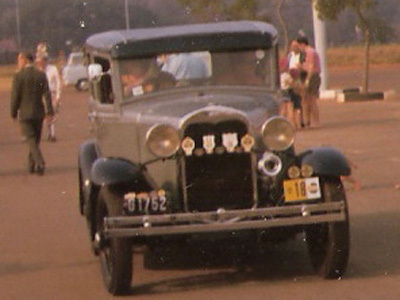 Year 1930 Believed to have been driven from Zambia to Rhodesia in the early 1970s. Later acquired by Alan Napier, then sold to Mike Le Patourel. Collected in 2008 by Viv Westbury after Mike passed away. Currently for sale for Mike's widow. 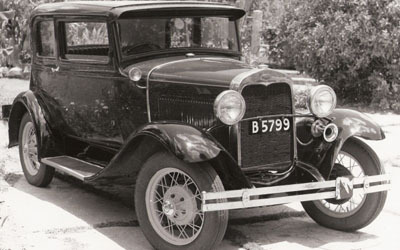 Year 1930 Acquired as a runner in the early 1970s by Lionel Lindsay, who strippped the vehicle planning on building a hot rod. Bodywork sold in the mid 1980s to Alan Murrell. Adrian and his father Keith started the restoration, which was never completed. Viv Westbury acquired the remains from Adrian in 2007. The photo below shows the vehicle put together with parts from his spares. Year 1930 Obtained by Bev Barnes of Marondera from Theo Crynkovic in Rusape, restoration started. Viv Westbury acquired the vehicle from Bev in 2006/07. Viv is currently completing the restoration. 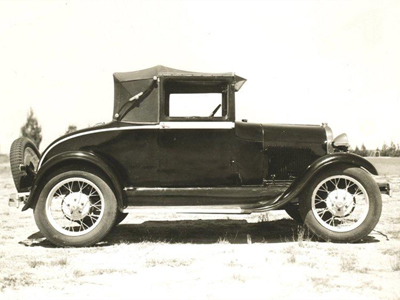 Noted the carport in the second photo, it is built from Ford Model A chassis frames! Year 1930 Sold by Tim Stopworth to John Levenderis in 1959. Rebuilt by John, then sold to John Voysey around 1965. Acquired in 1976 by Carl Mouton who took the car to Durban, South Africa. Acquired by Mr. Kennedy from a farmer in Northern Rhodesia in 1961. Taken to South Africa when he moved there in 1966. Photo shows car on the way to South Africa. Restored in 1974. 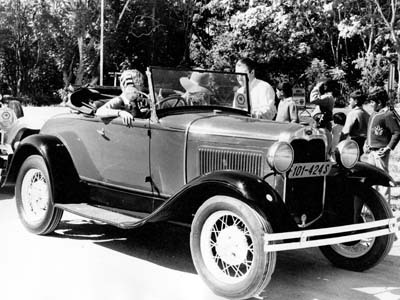 In 1994 the car was taken by Mr. Kennedy to Brisbane, Australia. Now owned by his son Grant. Owned by Jack Reeve of Trelawney for many years. Car rebuiilt for Jack by Mike van Breda around 1989. 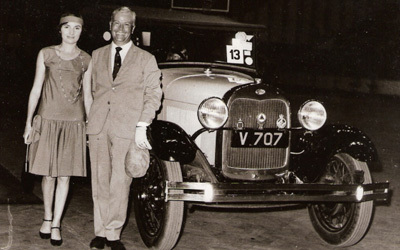 Jack was so pleased with the restoration that he later gave the car to Mike, who took the car to Perth, Australia. Later sold to someone on the East Coast of Australia. Body no. 16F397. 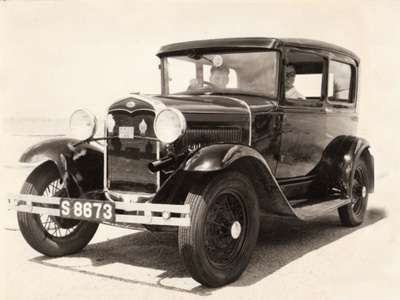 Only 1100 sedans, both slant and vertical windscreen, were built in 1931. Acquired by Ray Stitt in 1978, restoration started. Later passed through Howard Butler, J. Davy and various others before being acquired by Robin Hurst. In 2007 the remains were acquired by Viv Westbury together with a whole lot of parts. Now for sale as shown below. 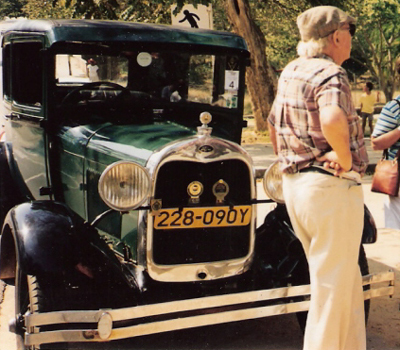 Recovered from the Bulawayo Car Club spares by Viv Westbury in 2007. Assembled to its present state from spares in Viv's collection, car is currently for sale. 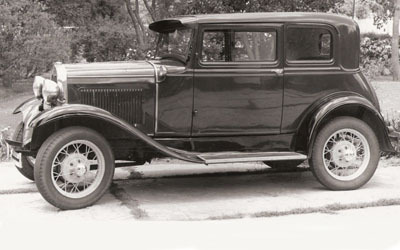 Firewall changed to try make the car look like a 1930 model, but the victoria sedan only came out in 1931. Thought to have been imported from Canada to Rhodesia in 1947. Owned by Stuart John Clarke in 1969, Ralf Cohen in 1970 and later by A. Lindner.